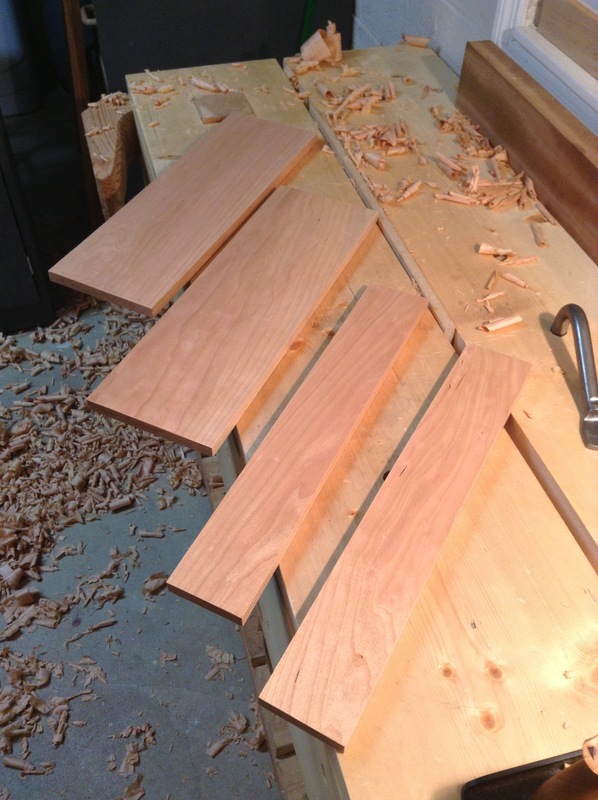 As always, I started flattening and truing one face of the board…it just so happened, the first board drove me crazy. Every once in a while, I get one of these boards that for some reason, just won’t cooperate with me…or perhaps I was just off my game. I continued to work this board for a long time, until I realized I lost almost a full 1/4″ of material. I got it as close as I could and called it done. When the time came to final thickness of all the boards for the shelf cross rails, I had to go with the least thick board…my friend who wouldn’t cooperate. As a result, all these pieces ended up being around 1/2″ instead of my goal of 3/4″. This really is no big deal at all…I actually prefer this thickness now for the shelves. It seems to lighten the middle of the chiffonier and balance the piece overall. I compare it to a drawer that has 1/2″ sides with a 3/4″ front face. Those 1/2″ sides keep the drawer from looking too bulky…that is exactly what the 1/2″ cross rails do for this chiffonier…funny how things just work out. Anyways, here they are in final dimension…ready to be marked up for tenons. I’ve got (16) sets of mortise and tenons to house these four boards into the sides of the two panels of the chiffonier. This entry was posted in Chiffonier, hand tools and tagged chiffonier, furniture, hand tools, woodworking by villagecustomfurniture. Bookmark the permalink.